If you love elephants this is a great place to take your children. It is an elephant orphanage in Langata, at the Nairobi National park. It is at one of those gates that are on the Rongai side. You can visit the orphanage for one hour, between 11 am and 12 pm. apparently if you adopt an orphan (50$) you can visit at 5 pm every day after the elephants have been fed. They are given a mud bath at this time. This is also a great chance to talk to your children about poaching and conservation. Elephants are beautiful creatures and you can start your child/ren’s love affair from when they are young. It costs Ksh. 500 per person. Nairobi is blessed to be the only capital city in the world with a national park inside it. The park which is just 7 km from the city centre is a great place to visit. You will find rhinos, buffalos, giraffes, lions, zebra, wildebeest and more than 400 species of birds. There are three options to choose from at the park. There is the animal orphanage where you can see animals in enclosures. The animals here were brought to the animal orphanage from the bush either because the animals were abandoned or injured. The Nairobi Safari Walk is a wooden walkway high above the ground at the Nairobi National park where you can walk around and look down to see animals in their natural environments. The Nairobi national museum is rich in culture and history. There is so much to see. Looking at the exhibits of Kenyan history with your children is a great chance to make history come alive for them. There is so much one can learn that is not in the history books. It is also great when somebody can see items and pictures from the past in order to create a mental image. There is a great collection of stuffed birds. There is also a great collection of stuffed animals and animal figurines. (I am not sure if you are able to see this every day. The last time I went it was a national holiday and I heard that this particular exhibit is not usually open). There are also anthropological discoveries from the Leakey family. There is also flora and fauna from all over Kenya at the botanical gardens. If your children are not afraid of snakes than you can also take them to the nearby snake park where they can see all sorts of reptiles includes snakes, crocodiles, and tortoises. There are also restaurants where you can take the children to have some food and drink. Located on Kiambu Road Paradise Lost is a favourite to many children and adults as well. There are usually very many activities to be done including picnicking, boat rides, camel rides, nature walks, cave visits, bird watching among other things. Growing up a visit to the Giraffe Centre for a school trip was celebrated. Children love animals and they will fall in love with the giraffes. Whether they have visited the Giraffe Centre or not this is one place children fall in love with and don’t mind going to again and again. There is an education centre to teach children about conservation. Visitors can also choose to stay the night at the Giraffe manor. The giraffes usually look into the dining room so that is a pleasant surprise. The children usually have a great time feeding the giraffes. Great for giggles too. This is located in Kitengela. You can feed the ostriches and ride them as well. You can also eat some ostrich meat or burgers. Nairobi (I think) has the only ice skating rink in Kenya. The rink is located at the Panari Sky Centre. They charge 800 for half an hour. It is a great place to spend time with your kids. There is also skating which is the new craze in town. You can take your children for lessons and if you are adventurous you can learn to skate as well. Splash is Nairobi’s largest water theme park, full of entertaining water slides and shallow pools. On those hot days in Nairobi, Splash is a great place to cool off for the entire family! It is located out by the Carnivore restaurant. This is a great place to learn about the history of the railways. They usually have one of those small trains for taking round children but the last time I was there it was been serviced so call beforehand to find out if the children’s train is still operational otherwise you might be disappointed. There is not much to see inside the museum so children might get restless if there is nothing to keep them busy. There are many movie theaters around Nairobi where one can talk their children to watch a movie. Nowadays there are many animations and child friendly moves coming to the cinemas so you can’t miss something to watch with your children. Explore the Maasai Market. During the weekend you can usually find the Masai market outside the law courts. This is a great chance to teach your child to love and appreciate African art and ornaments. There is everything you would ever need from a curio market from cloth, to jewellery, carvings, bags, shoes, paintings etc. Take them with you and let them see what Kenya has offer. It is said that children usually model what they see their parents do. So if you like African artifacts then they are likely to like them too. It is also a great opportunity to teach your children about bargaining. These are forest sanctuaries that are great for hiking, biking and taking nature walks. Go carting at GP carting. 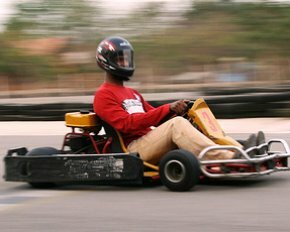 Defination: Kart racing or karting is a variant of open-wheel motorsport with small, open, four-wheeled vehicles called karts, go-karts, or gearbox/shifter karts depending on the design. They are usually raced on scaled-down circuit. There is GP Karting just past the carnivore. This is a great place to help your children master the art of driving without them causing an accident with your car. This is also great for teenagers who love speed racing. There are many art galleries scattered across Nairobi. If you or your child is interested in art it would be great to go to the art galleries together. It is also a chance to teach your children an appreciation for art. Lunar Park located next to Uhuru Park has different kinds of amusements for children. They also have a food court so you can sit at the food court and watch your children take part in different amusements. Nowadays many new malls have children’s activities and amusement facilities. There are now so many music events like Safaricom Jazz festival and Koroga which are child friendly with activities specially for children. Share your love of music with your children and teach them to love music as much as you do. Nairobi National Park – a great experience.